“I have known Stephen for 20 odd years, so we were not completely unknown to each other before we started on the kitchen, but I hadn’t done serious business with him at all. In general terms the way he brought together the plumber, the electrician, the floor layer – some of whom had already worked for me before – he co-ordinated it all very well indeed. We managed the project together, although he did more than I did. “I have complete confidence in Stephen. I felt confident before I started, but I had no reason through the whole process to change my mind at all. He’s very professional, his build quality is absolutely first class – no problem there at all. “I live in a typical Regency cottage, and for a little cottage it’s a fairly good sized kitchen. To start with I roughed out what I wanted, and he was basically happy that what I wanted would fit in. Obviously he went away and did some plans for me, which we tweaked here and there. That whole operation was completely painless and useful and I was happy with it. “There were one or two issues I didn’t know about, but I knew he would because he does it all day, every day. I was relying on his feedback and expertise. I wanted one of those boiling water taps. I was very keen to have one – he said he had one in his kitchen that pleased him so much he’s installed one in his workshop. Since I’ve been using it I haven’t used a kettle once! Having that reassurance from him was useful. 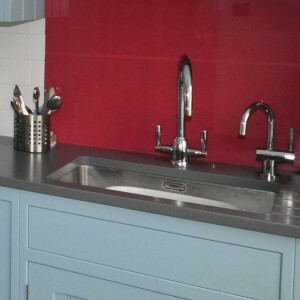 “I wanted a granite type work surface. He steered me away from granite towards quartz and I am absolutely delighted with it. “The build quality of the cabinets I never had any doubts about because I had seen Stephen’s work elsewhere. On the door panels, instead of just being a flat panel he has recessed the middle bit and introduced reeding. It really makes a difference and looks really good. Little things like that help enormously. “The work was completed exactly within the time allocated and although I didn’t have the use of the kitchen for probably ten days, as soon as I possibly could Stephen made sure that I had a hob to use. “As far as problems are concerned there was a minor hitch with the ceramic hob and Stephen came and sorted it out. In the future, if I have the slightest thing go wrong, I know he will come back and I know it would not be a chore. He also used Keith Brickwood and he is absolutely first class. I know most of the people which is a great help.